I told you I’m somewhat obsessed with beachy/cottagey styles. Last time I showed you an all-white super comfortable home in Australia that I love, but there’s another house that I’ve spent a lot of time studying that’s a completely different take on the same theme. This home in California is chock full of color and pattern, via House Beautiful. A view of the living room. Tons of color, but it doesn’t seem overwhelming because of plenty of white. Look at how many different patterns can mix together so well. I wouldn’t necessarily want this many competing patterns in my own home, but I enjoy the way it looks here. I love love love the polka dot ottomans. 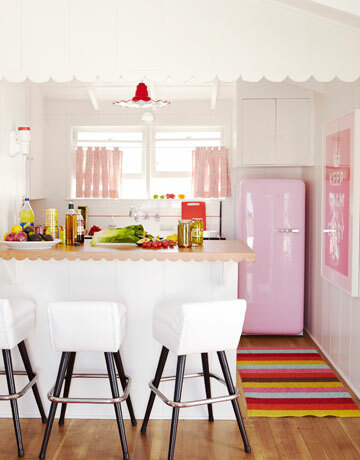 A pink kitchen!! A pink fridge!! I want that red scalloped kitchen light and wonder where it’s from.